The Chemical Burn is a take on a juggernaut of 60s fuzz sound - the Shin-ei/Companion Superfuzz FY-6. 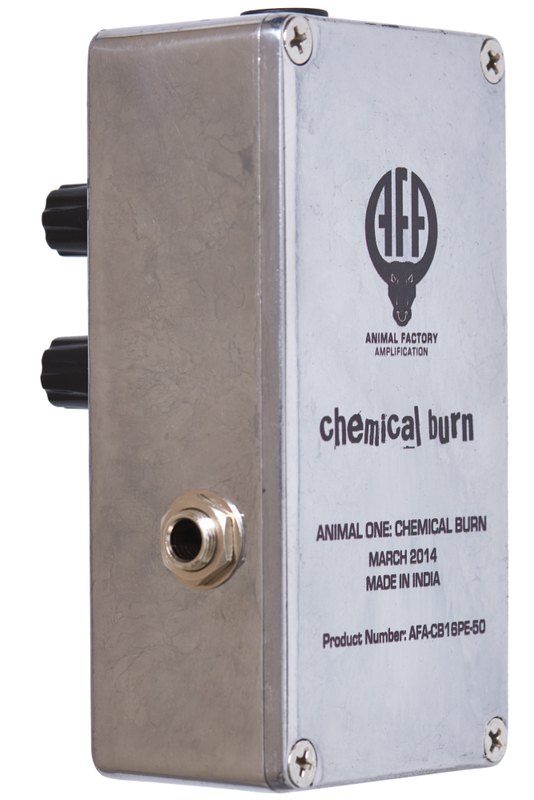 Chemical Burn is an almost-faithful reproduction of this classic, with a few modern twists that make it more usable and versatile and add new operation modes to this classic circuit. The basis of operation remains the same. If you're looking for a subtle fuzz that cleans up well when you back off the volume control, you're clearly in the wrong place. SKIN - The fundamental at its maximum/least octaving. “Trails” on fast decay notes. FLESH - Some cancellation and octave. Some “trails” possible. BONE - Maximum octave mix, like the stock FY-6 Superfuzz. 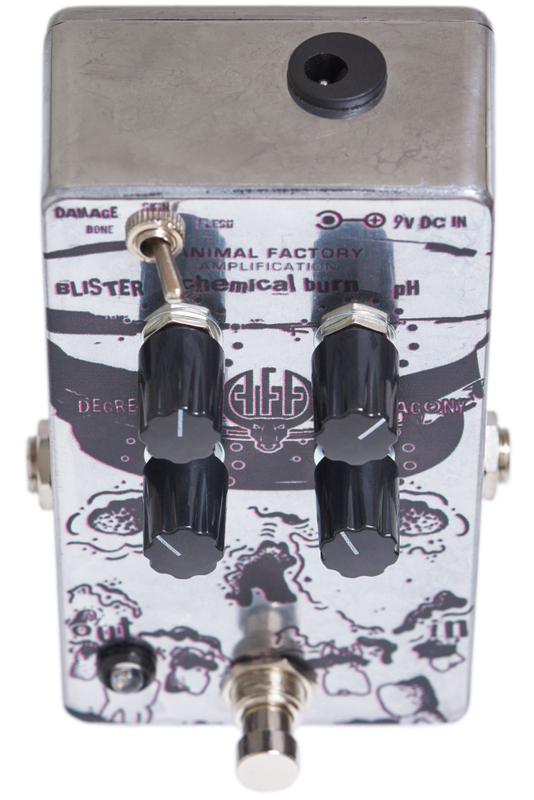 BLISTER: Mixes between silicon (counter-clockwise) and germanium clipping (clockwise) which lend a different character to the overall fuzz sound. Intermediate settings will lift the clipping and greatly increase output volume. DEGREE: The fuzz or gain knob. Turning it up increases the overall gain and distortion. Lower gain settings will cause gating to kick in earlier. pH: An unconventional but effective tone knob. Turning it counterclockwise, the mids are very scooped. Turning it clockwise flattens out the mids for morec onventional fuzz sounds. 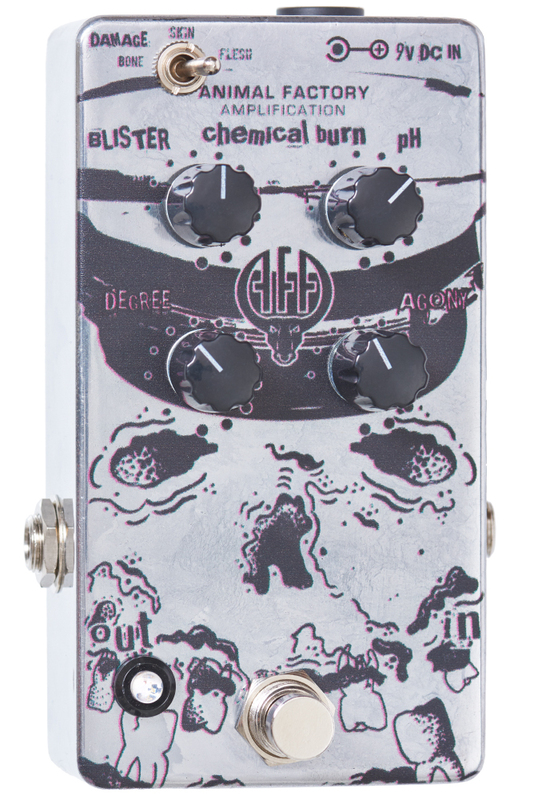 AGONY: While it mainly functions as the volume knob, it also contributes to final stage gain. Play with the DEGREE and BLISTER knobs to find interesting gain/volume settings.